Enjoy the advantages of instant borrowing or lending secured by crypto. Discover attractive terms and low transaction costs here. Share your experiences, get excellent service support, and make your life and business better with LendaBit.com! P2P lending platforms have long become a part of the financial world, with many people using them on a regular basis. Lenders and borrowers flocked to these platforms, as they are much faster and more convenient than traditional financial institutions. Platform based on the best practices and recommendations from the best- recognized experts, notable models and OWASP guidance. Distributed access management system to eliminate hacks and wallet theft. Cutting-edge, blockchain-based technology used for the web development. Additional layer of security provided by the 2-step verification process. Intrusion detection and prevention tools, system monitoring, multiple levels of protection to make successive attacks highly improbable. All transactions are verified and analyzed by https://crystalblockchain.com/. System of effective DDos-attack deflection regardless of its complexity. The Smart Contract source code is publicly available. Anyone can audit it and check its functionality. Usage of multi-signature wallets located on secure servers without network connection. An additional confirmation by Email, SMS or 2SV is required to withdraw funds. The collateral amount is stored at the individual client's address and does not move unless there is a transfer ticket. Anybody can check it using blockchain. Only the clients that have passed through KYC verification have the full functional access to the system. Peer-to-peer crypto lending has proved to be a perspective and attractive financial tool for a multitude of lenders and borrowers, and Marat Kichikov, Managing Partner of BitFury Capital, together with top executives of the collaborative investment fund gave their credence to fintech startup LendaBit.com and became the seed investors of the novice firm. P2P lending platform LendaBit.com has managed to unite highly qualified professionals who specialize in finance, risk management, blockchain technology and secure profile provisioning architecture with an aim to create an excellent, easy and transparent platform for lenders and borrowers. BitFury Capital supports the growth of the Bitcoin ecosystem and facilitates further dynamics of development of blockchain-based companies. Having BitFury Capital’s top management as the seed investors is a terrific step towards adoption of innovative solutions and implementation of a unique mix of fintech expertise and global market intelligence. I’m absolutely confident that blockchain and crypto ecosystem are bound to make contemporary lending services fair, secure and transparent. Blockchain-based P2P lending secured by crypto collateral is here to make the unavoidable happen. Deniss Moscenko is CEO at LendaBit.com and he’s been in asset and risk management for 21 years in one of the top Latvian banks. Agustín Fernández Clemente is an experienced entrepreneur and accomplished investor who is majorly focused on fintech ventures and ambitious startups. Igor Kovorotny is COO/Product Owner at LendaBit.com with hands-on experience in business management, product development and strategic planning. Alex Maznyi is a result-oriented Project Manager at LendaBit.com who is capable of setting long-term goals and achieving the planned outcome. Why use the LendaBit.com platform? The platform has been designed to remove all unnecessary steps from the lending process, thus more attractive terms and conditions to both lenders and borrowers. The customer interface and data processing behind it are structured so as to support prompt and secure transactions. Normally, making a loan or lending should require just a few clicks. LendaBit.com loans are secured by crypto collateral provided by borrowers. The crypto collateral value is monitored on an ongoing basis to make sure the loan amount is covered by crypto collateral at all times. Borrowers are requested to add crypto to their collateral if its value decreases. How is the interest on loans calculated? Interest is calculated based on the formula: Daily Interest = (Loan Amount × Interest Rate) / 360, where 360 is used for the number of days in the year no matter what the actual number (365 or 366) is. How quickly can the loan be made? Lenders are ready to make loans as soon as they have registered on the platform and provided a deposit. 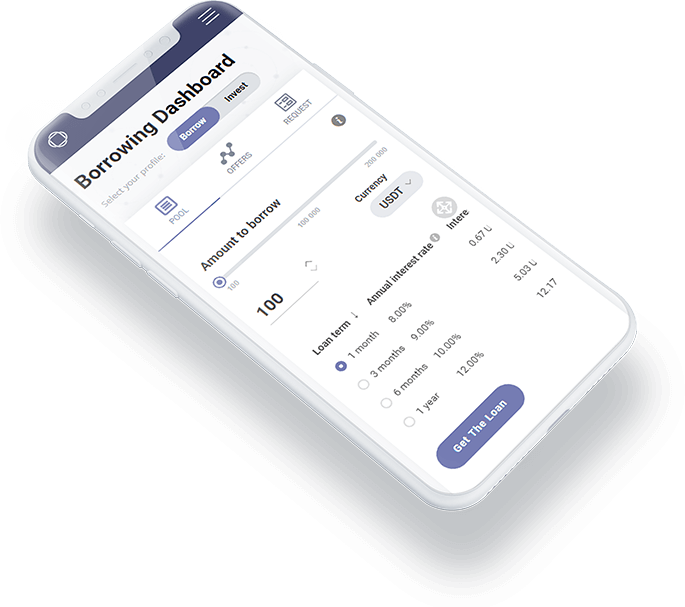 Borrowers are ready to apply for loans as soon as they have registered on the platform and provided crypto collateral. Normally, this will require just a few clicks. Make Things Happen The Way You Want With LendaBit.com!